Indian Heart Journal (IHJ) is the official peer-reviewed open access journal of Cardiological Society of India and accepts articles for publication from across the globe. The journal aims to promote high quality research and serve as a platform for dissemination of scientific information in cardiology with particular focus on South Asia. The journal aims to publish cutting edge research in the field of clinical as well as non-clinical cardiology - including cardiovascular medicine and surgery. Some of the topics covered are Heart Failure, Coronary Artery Disease, Hypertension, Interventional Cardiology, Cardiac Surgery, Valvular Heart Disease, Pulmonary Hypertension and Infective Endocarditis. IHJ open access invites original research articles, research briefs, perspective, case reports, case vignette, cardiovascular images, cardiovascular graphics, research letters, correspondence, reader forum, and interesting photographs, for publication. 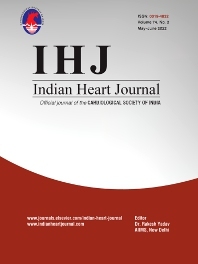 IHJ open access also publishes theme-based special issues and abstracts of papers presented at the annual conference of the Cardiological Society of India. IHJ open access is currently indexed in Scopus, Medline and Embase. We also provide many author benefits, such as free PDFs, special discounts on Elsevier publications and much more. Please click here for more information on our author services.